Clean the solar panels is really useful? 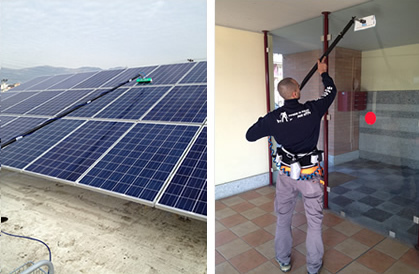 With what frequency should be made the cleaning of photovoltaic panels? Imagine the solar panel as a mirror, exposed to sun, rain (remembering that contains impurities and is therefore not recommended as a cleaning system), wind, excrement of birds. All these impurities are deposited on the panel, damaging the yield over time. If you do not provide a periodic cleaning of photovoltaic systems, it is possible to reach about 20-25% less of performance. Over the years it could incur therefore to a deterioration of the panel, decreasing its power receptor, whether the maintenance of the photovoltaic panels would not be carried out. What kind of filtration technique of water is used for washing the solar pnales and windows? The technique of filtering the water used for washing the photovoltaic panels and windows is the reverse osmosis. How many liters per hour produce the machinery for cleaning solar panels and windows? What is the maximum extension of the poles and with what materials are produced?? The production of pure water for cleaning outdoor windows and photovoltaic panels is as follows: OUT MINI 100-120 l / h; OUT 1800 200-220 l / h; OUT 3600 450-500 l / h.
How many filtration stages exist? How long are the pre-filters? What do you connect to the machine to work properly? 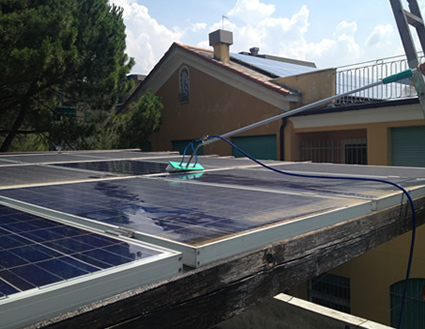 Is it possible to clean photovoltaic panels both on land and on the roof? How high you can clean outdoor windows? Can I also clean indoor windows with the products of VIP Clean? Can I clean the floors with COVER 8.16?